This Broadcast has been cancelled so we can bring you the visit by Bernie Sanders to Cloverdale. 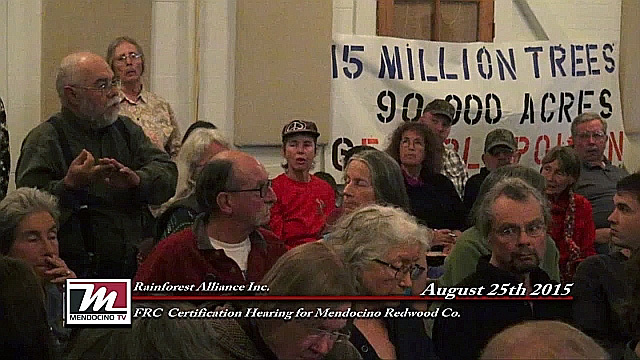 Measure V will safeguard all of us from the Mendocino Redwood Company’s current management practice of killing millions of tanoak trees and then leaving them standing dead for years and years. A majority yes vote on Measure V would declare these trees a public nuisance that endangers the health and safety of County residents and is a life safety risk to firefighters. Since the ballot initiative came from the volunteer firefighters after the county supervisors dodged responsibility and because we all learned after passing an anti-herbicide ordinance decades ago, that only State can regulate herbicides, we will not be focusing on the hack and squirt forestry practice but rather on the fire dangers of intentionally leaving vast stands of dead trees surrounding our rural communities and cities. We will be focused on herbicide dangers on our June 10th show when we examine the recent news that Mendocino, Napa and Sonoma winds tested with various levels of the toxic antibiotic glyphosate that is in the toxic chemical mix called Roundup. As the corporate owners declined to talk with us we will show you select video clips of the public meetings they did attend. Since they have chosen to go to the dark behind their propaganda we will also refer to their own PR. When call-in begins we will host will perish, award-winning journalist, who will put this forest management issue in its political and economic context. Now To start stirring the mix and to generate some phone calls I am going to begin this conversation by POSTING some MRC claims from their Facebook posts and a comment from Jenny Shattuck; as well as an endorsement of measure V and then a mysterious retraction by the former head of LP Timber Company Bob Simpson. “MRC recommends voting no on V because, they say, it will demolish their ability to restore conifer balance in the forest, and it will reverse environmental progress as well as their economic foundations. As they now refuse to defend those pretty extreme claims they appear to be relying on more direct ways to influence the vote. MRC top management has been visiting logging companies insinuating they won’t have a job if they don’t oppose V? That V would somehow stop logging or restoration. I talked to two such logging companies yesterday who reluctantly put up no on the signs but privately were voting in favor of V. One owner said a dead tree is a dead tree if these fools in upper management think that their policy of restoration is good, They are dead wrong. If Donald Fisher was still around this would not be happening. That was from a post on FaceBook by Jenny Shadduck.